Castle Vardulon: Joy Ride 2: We were unable to secure the return of Buffalo Bill from Monk! Joy Ride 2: We were unable to secure the return of Buffalo Bill from Monk! 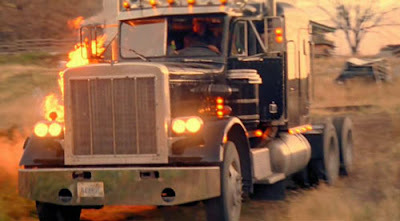 This isn’t meant as an overall complaint about the film, which is an utterly servicable thriller and perfectly fine follow up to the first Joy Ride, which is notable for being the last film J.J. Abrams wrote during the ‘hack screenwriter’ phase of his career, before moving on to the ‘genre visionary’ phase. It was also the second time that year Paul Walker had appeared in a film with Ted Levine, although in Joy Ride Ted just did a voiceover once production was finished. 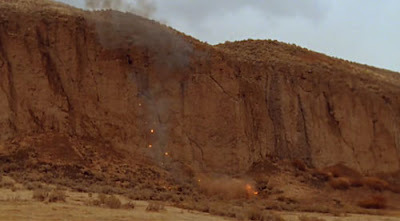 The plot of this film is fairly similar to the first, in that people driving through the desert get menaced by a trucker, but differs in the villain’s incitement to action. This time, rather than the main characters going out of their way to mess with a stranger and earning his ire, it’s a random, somewhat understandable error that causes the problem. This leads to kidnapping and sexualized violence/humilation, as you see more and more often in film these days. My problem with the movie comes right at the ending, and it’s kind of a key one – the sequel setup. Look, I know you want a franchise. Everybody wants a franchise. That’s why when the main girl knocks the evil trucker out with a shovel she doesn’t do the only sensible thing and keep chopping away with it until his head has been removed from his body. Hell, even the first movie went out of its way to try and start a franchise. 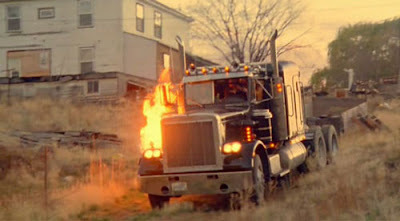 As we learned from the DVD’s special features there were four endings where the trucker died, and a (kind of preposterous) fifth ending where he’d knocked out another trucker earlier and stowed his body in the truck just in case at some point in the future he might have to fake his own death. With that monetary motive in mind, I’ll accept that you can’t kill the villain off at the end, but I have to ask you to do something for me if I’m going to give you that. I need you to make the way that the killer can survive when the main characters think he’s dead even slightly plausible, something that this film utterly fails to do. The Main Girl drives away from the Killer in the cab of his truck. It’s night, and it’s pouring rain. But the killer has jumped aboard! Oh no! Also, it’s still the middle of the night, and pouring rain. 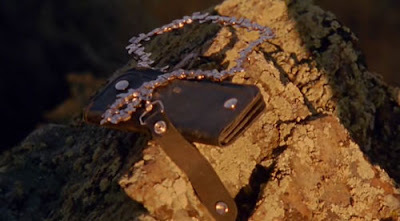 Now, at this point we cut away to the main girl’s Boyfriend, who’s back in the truck’s trailer, which was left behind at the killer’s house, and where it’s clearly still night. A few cuts later the girl and killer are in the cab of his truck, wrestling over the wheel. Also the sun came up very quickly. 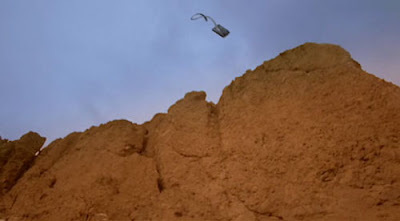 Then the main girl notices that a cliff is coming up quickly, and jumps out of the car, leaving the killer to try and get the car under control. Then it goes over said cliff. I know what you’re thinking – if the main girl could have jumped out then the killer could have jumped out too, right? Well, sure, but if he did, then where did he go? The main girl and her boyfriend immediately walk over to this cliff to look at the wreckage. Please notive that there’s absolutely nothing the killer could have hidden behind while they were doing this. And that’s when things get really stupid. What does the main girl see lying at the edge of the cliff, no doubt where the mysterious trucker jumped out? Yes, it’s his ‘trucker wallet’. So what does she do? Kicks it over the side. Don’t you think the cops might have wanted to get a look at that? I mean, sure, you’re at the guy’s house, and you can tell the cops about that, but he’s a crazy murderer, so who’s to say he’s not just squatting in the domicile of another of his victims? This isn’t as stupid as the end of Friday the 13th. But it’s pretty dire. And then we get a coda, where the killer has obtained another truck, and kills someone else. Here’s the thing, guys. It’s tough to make a sequel setup fakeout that works both as a stasifying ‘ending’ for the villain, then a startling reveal when he managed to survive. The finality/escapable tightrope is a challenging one to walk. If you’re doing some research, check out Caibn by the Lake, starring Judd Nelson. One of the best setup and payoffs in the history of villain getaways. So clever that you might not even notice the groundwork being laid for the eventual resolution. Oh, and in a weird coincidence, the Fake Ted Levine in this film, Mark Levine, was in the sequel to that movie, ‘Return to the Cabin by the Lake’. Small world, huh? But don’t watch that movie. It’s awful.